Good Clean Fun: Soap Carving! A few weekends ago, we took the kids for a night of camping (see my post here). While there, we splurged on a 99 cent pocketknife for each kid. They whittled away at sticks for hours while we attempted to get the campfire started. 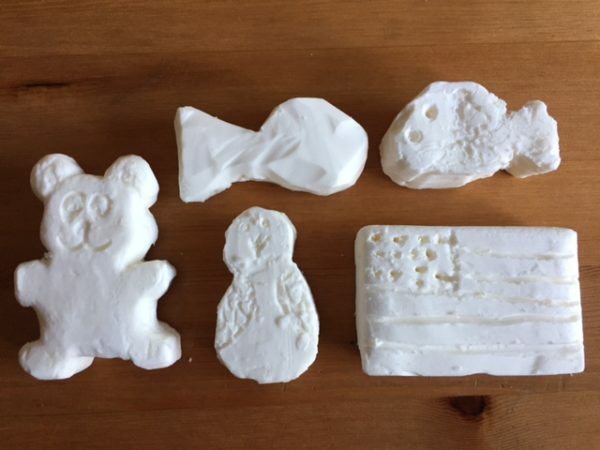 When we returned home, they wanted to continue to practice their new skills, so I reached back in my memory to my early years of as Girl Scout, and told them about soap carving. They were intrigued! We Googled "soap carving" images, and oooh'd and aaaah'd at the amazing detail and time people put into their soap sculptures. Owls! Bears! Fish! Ladybugs! Sponge Bob! Turtles! To get started, we just needed a few simple supplies. First, we bought an 8-pack of Ivory Soap. There are three reasons we chose this soap, in addition to the fact that it was what I used as a kid. It is cheap. Unless your child will want to bathe with their latest art project, you have to think of this soap as simply art materials. It is rectangular. Any shape soap is fine, but oval soap reduces the design possibilities. It is soft. Again, you can use any soap, but the harder soaps will take more effort and time, and stronger tools. Soft soap bars, like Ivory, carve very easily, so it makes a great starter soap for little ones. Next, we gathered our cutting tools. Though the kids tried their pocketknives, we found that a popsicle stick cut into a point (easily done with scissors), is just as good, if not better, and reduces injury possibilities. They could carve and poke holes in the soap with the point, and use the straight edge to smooth out the surfaces. You might also want to offer a few more tools so they can experiment: toothpick, fork, spoon, sharpened pencil, etc. We covered our kitchen table with newspaper, and researched a few design we wanted to try. I reminded the kids that this was their first time, so their pieces might not look as professional as what they saw online. It was the fun the counts! The kids traced out their shapes on their soap bar with a pencil (they each started with a fish), then started carving away with the pointed popsicle stick. They both seemed pretty surprised with how quickly the carving went. By the end of the hour, they had each completed three successful soap carvings, including fish, an owl, and an American flag. I also tried my hand at it, and came up with a decent bear (though it might look more like a mouse). After our carving time, we had a huge pile of soap shavings. The kids decided to add a bit of water, form it into a ball, wrap it in waxed paper, and stick it in the freezer. I think they had intended to use it during their next shower, but it has now been in there for over a week and has given my frozen foods an interesting "fresh" taste. With our extra bar of soap, I decided to show them a pretty cool experiment that I learned while observing a kids science class at the Y. I started by asking them if they thought the soap would sink or float, then we checked our prediction. If you remember the commercials from our childhood, you'll know that it floats. When Ivory Soap is made, it is whipped so there are many tiny air pockets throughout the soap, which causes it to float. I then dried off the bar and placed it on a plate in the microwave. We set the timer for about 2 minutes (though stop the time whenever you want), and watched the soap expand into a crazy fluffy flaky puff! (As the water in the air in the pockets and within the soap heated up, it vaporized and the air expanded, causing the soap to puff up!) Pretty cool! We let the soap cool for about a minute, then the kids had fun playing with it. I've heard that some people use the soap fluff as laundry detergent, but we ended up just throwing it away when we were done. NOTE: This only works with Ivory Soap. Other soaps will turn into a runny, burning mess. So, one pack of Ivory Soap allowed us to get clean, explore our creative sides, and learn some science! And to top it off, my kitchen smelled fresh for the rest of the day!